One of four brothers to play VFL football, Terry Daniher was recruited by South Melbourne from Ungarie, where he often played both football and rugby league on the same weekend, in 1976. A year later he played the last of 19 games for the Swans in their losing elimination final against Richmond; during the close season he was traded to Essendon in exchange for centreman Neville Fields. Terry’s brother Neale, who at that stage had not played a league match, was included as part of what was popularly (although not perhaps entirely accurately) regarded as one of the most one-sided trades in league history. What is impossible to deny, however, is that Essendon had every reason to be delighted with their side of the deal, as both the Daniher brothers went on to make significant contributions to the club. As far as Terry is concerned, there have been few more popular clubmen in Essendon’s illustrious history. Captain of the renowned 1984-5 premiership sides he played a total of 294 games for the Bombers between 1978 and 1992, was best and fairest in 1982, and twice topped the club goalkicking list. Despite being a New South Welshman, he represented Victoria on 10 occasions in so called ‘state of origin’ football, as well as representing his home state four times (all as skipper). He was also Australia’s International Rules captain against the Irish in 1987. 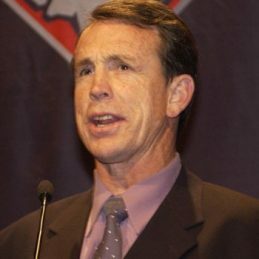 The nadir of Daniher’s career came in 1990 when he was suspended for 12 matches after his involvement in an on field fracas during Essendon’s Grand Final loss to Collingwood. However, he resisted the temptation to retire and in 1991 played in his 20th league final for the Bombers, and his 21st in all. Terry Daniher ended his career on a high note of sorts when he played in Essendon’s 1992 reserves Grand Final defeat of Melbourne. He has an amazing repertoire of stories from his playing days that makes booking Terry a sure fire hit with clients and staff.